UPDATE: SOLD! Thanks Bob! This unit has found a new home at Tufts University, but most importantly, it will be used for scientific research - I just couldn't wish for a better new owner. If you are looking for a "cheap VNA", "just anything that will plot a Smith Chart or "an incredible bargain VNA", please don't waste your time reading this post. There are other, less expensive solutions out there and some cover even wider frequency range than N2PK VNA. Coming here, while searching to buy an N2PK VNA in particular, you probably have a good idea why you want this specific VNA design and what it is capable of. Then, if you are handy with the soldering iron, worked with SMDs before and have plenty of time and patience, I'll encourage you to try to build one yourself. I have for sale a very high-quality, custom built with an extreme attention to detail, no-expense-spared, no-corners-cut "kind of deal" VNA. This an absolutely completed N2PK VNA set ready to be connected to a computer and DUT - not a bit of additional work is needed. It is for somebody who wants to quickly get a hold of a fine N2PK VNA and own a superb, completed unit and a set of accessories, without the hassle of the DIY project. This is not something, quickly slapped together and shoved in a box - it is an accurate and capable instrument, built with passion and skill. It is probably as good as it gets, short from a CNCed enclosure or an "oven"-ized unit. - N2PK VNA based on Ivan Makarov's v4.3 PCB, ALL of the components are from Makarov's/Paul's original BOM (no substitutions), Master Oscillator is by Connor-Winfield (not the VF pictured). Both detectors are shielded in separate RF cans. Inputs and outputs of each detector are also internally shielded from each other inside each RF can. Both DDS chips and the MO are all heat-sink cooled (MO is using separate heat-sink). Everything is hand-soldered, component placement and soldering work is impeccable (30 years of experience). High-quality MA/COM gold-plated SMAs on the main PCB. There was no rework during the building process whatsoever or any need for troubleshooting - everything worked the first time. The Internal Multi-voltage Power Supply module is custom made (I have designed the PCB layout) using switching and linear voltage regulators. Shielded in a separate RF can and with extra noise filters, over-current and over-voltage protections - provides highly regulated and clean power. The thermal design is using the extruded aluminum enclosure as a giant heat-sink, stabilizing the internal enclosure temperature. Amphenol-RFX BNC connectors installed on the front of an attractive extruded aluminum Hammond enclosure. There are no holes or screws on the outside of the enclosure except for the stainless steel Allen-key screws attaching both face-plates. Custom designed graphics layout and durable plastic lamination of the brushed aluminum face-plates for a professional "Lab Instrument Look". Connections between LO DDS out and detector's LO INs are looped-through on the front panel for additional configuration flexibility. 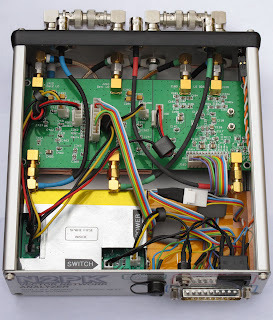 The internal interconnects are done using gold-plated and stainless steel SMA connectors, semi-rigid RG-405 coax and special high-isolation (triple-shielded) Semflex mil/aerospace grade teflon / silver coax for minimal loss, phase errors, cross-talk and RF leaks, resulting in a very low noise floor. Extensive ferrite RFI filtering for all power and signal lines. Everything is modular and interconnected using quality gold-plated connectors - front and rear panels, Main VNA board and Internal Power Supply Module - all can be easily disconnected from each other and removed if necessary. All you need to take the whole instrument apart is an allen key and a SMA wrench. All connectors are properly marked to avoid connection mistakes. The Main VNA PCB ground layers are connected to the chassis by 2 special edge mounted copper-beryllium clips - it is a solid friction mount for the PCB assembly. Dynamic Range is between 120 dB and 130 dB as expected - on request I can provide noise floor plots for both detectors. Frequency range is the typical N2PK 0.05 to 60 MHz. Minimum voltage supply required at the rear DC jack (PS is using linear LDO regulators) is 13.4V (maximum recommended +18V). 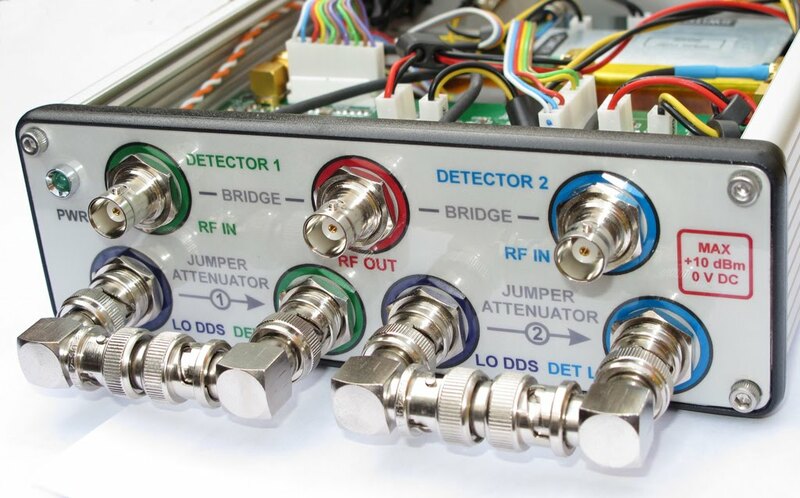 The Accessory connector has all extra control signals and +9V power for connecting a S-parameter Test Set with Adjustable Attenuator control, RF-IV Sensor or Transverters. interface EEPROM is already programmed, only drivers need to be installed on the host computer). This converter is specifically designed for N2PK VNA by the creator of the MyVNA software. It is mounted in a separate die-cast aluminum enclosure for RFI shielding and it is allowing the user to effortlessly select Parallel Port or USB interface use. - The standard N2PK T1-6T Reflection Bridge /w BNC connectors (Female silver-plated BNC DUT port). Mounts directly onto the VNA front panel connectors. - N2PK VNA RF I/V Sensor. Uses only one VNA detector, feeding I and V samples from the DUT. Employs Makarov's PCB and ferrite cores for both transformers. Extensive internal RF shielding between components. Mounted in aluminum enclosure, native stainless steel SMA (f) connectors and HQ SMA-to-BNC between-series adapters already installed. Plugs directly into the VNA Accessories connector and mounts right on the front panel VNA connectors. - Custom External Power supply - small, low-noise, regulated and filtered linear 16V power supply. Using external PS reduces internally generated heat and RF noise. - A set of Open, Short and Load (50 ohm) Male BNC cabliration standards ,an additional male BNC connector for use as a Test Fixture (same reference plane as the calibration standards) - just solder DUT directly. The Load standard is using special high-frequency, high-precision resistor. Price is set to $995 and includes insured USPS Priority shipping. Shipping to Continental USA ONLY! No international buyers please. Payment can be done by mailing a Cashier's Check or a Money Order only. Will ship in two business days of receiving the funds. I have built two N2PK VNAs - a smaller enclosure, BNC version with external USB converter (this is the one I am selling) and a larger Type-N connectors version with an integral USB. It seemed as a good idea at the time to build two units - one for portable / field use and another unit for my lab work-bench. As it turns out - only one unit covers completely my VNA needs and I decided to sell the extra one in order to raise funds for some future projects I would like to dive into. It just doesn't get used enough and it is sitting on my shelf, while somebody could have a good use of it. As I stated above - no expense was spared when building this VNA - I was building it for myself and not in a hurry - I wanted to have the best, the N2PK design has to offer. I've used the highest quality components and materials I was able to put my hands on and took me months to complete it. The built process is very well documented here, on my blog - from August 31, 2009 and on. You'll find many pictures and comments regarding this unit. I am not trying to get rich by all means with this sale, so let me be upfront - the cost of components and materials is somewhere between $700 - $800 (I have Digikey/Mouser/eBay invoices for most of the components and materials). It took me many weeks, if not months to collect all of the parts and build this instrument - many hours of SMD soldering under magnification, painstakingly inspecting every single solder joint, a lot of mechanical work on the face-plates, the semi-rigid coax assemblies and the PS Module, design work (CAD PCB layout for the PS, graphics design for the panels), wiring etc. Frankly, I can not even put value on the time and labor this project so readily consumed. I think the sale price is fair and if it doesn't sale I won't be incredibly disappointed - I have some mixed feelings about selling it anyway.